Looks good to me. Thanks for working it out. Go ahead and post for us or I will post later tonight. 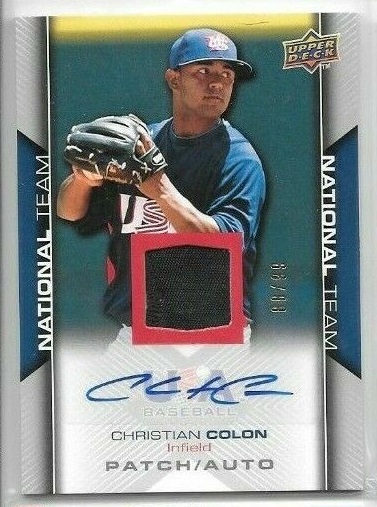 Found another Colon auto, but this one is a relic auto and serial numbered /99. Any interest? I can use the McGwire GU. Anything you can use from my site? LMK. Thanks!! Nice card, but I don't need it at this time. Thank you, though. I'll check your trade list and will let you know, probably via pm. Thank you. Don't know its BV. Do you have a trade list? Didn't see anything there I can use. If you remember we had the problem with the Lindor creased GU card. Maybe you can list me your $25 or $30 cards from your trade list, if that's OK with you. Thank you. sure thing... how about any of these? I'll take the Marichal. Thank you. Let me know and I will post.